Potty training is part of life with a young child. Once you hit that amazing milestone and your child stays dry during the day, it’s time to celebrate – even if the wetting continues at night. Potty training is part of life with a young child. Once you hit that amazing milestone and your child stays dry during the day, it’s time to celebrate — even if the wetting continues at night. There's no need to worry though; nighttime dryness happens when children's bodies are ready for it. Achieving nighttime dryness is a completely different process from learning to use the potty and cannot actually be trained. Bedwetting is a developmental, completely normal phase, with 1 in 6 kids dealing with it as they grow up. It won't help you or your child to get upset about it — for the vast majority of kids, a dry bed will come in time. Until then, GoodNites® NightTime Underwear for boys and girls keeps your kids dry, saving you from constantly changing pajamas and sheets. They allow parents and kids to focus on their bedtime stories, not their bedtime worries. Still, parents will do anything to help their kids stay dry at night. Laura Richards, a mom from Boston, Mass., took her son to the bathroom numerous times during the night. But that didn't work. Without warning, his bedwetting suddenly stopped. “He was dry for a night and then it continued. He clearly just needed extra time to mature and develop, just like it takes some kids longer to learn to read." GoodNites® are specifically designed to deliver the best nighttime protection for children who wet at night, covering your kids when they're sleeping and providing 40% more protection than training pants. They aid you and your little ones as you go through this chapter of growing up. Leslie Elia, a mom from Ohio, knows they work. Both of her daughters quickly trained by day with no wetting at night, but then her son came along. “He was daytime dry at 21 months, which is early, but a nighttime bedwetter until he was eight,” she says. 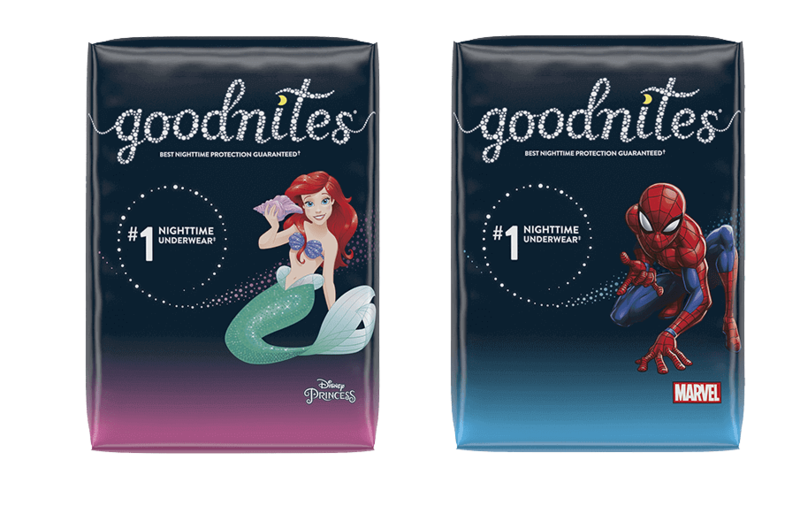 GoodNites® helps you and your family worry less through the night until nighttime wetting subsides so you can focus on fun instead.